London South Bank University (LSBU) has today (Friday 22 September) been named University of the Year for Graduate Employment by The Times and The Sunday Times Good University Guide 2018. LSBU yet again challenged the UK’s most prestigious institutions both on salaries and types of jobs held by graduates, as well as reaching the top 20 for graduate prospects. Average salaries of LSBU graduates going into highly skilled jobs are typically thousands of pounds above the national average. LSBU also jumped 14 places in the overall league table following a similar trend to that seen in other tables. The news comes as the University prepares to welcome prospective students for its Open Day on 11 November 2017. 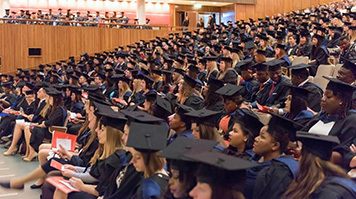 LSBU has an enviable record in the graduate jobs market. Almost 7,000 students – more than one in three undergraduates – are sponsored by employers and the University has forged relationships with over 1,000 employer partners. Median LSBU graduate salaries stand at £24,000, a level bettered by just ten universities nationally. LSBU also falls inside the UK top 20 when considering the number of graduates in professional jobs or further study six months after graduation. Responding to the good news, David Phoenix, Vice-Chancellor of LSBU said: “This achievement recognises the importance LSBU places on delivering courses that are supported by industry and where possible accredited by professional bodies. Our close relationship with over 1,000 employers helps ensure we are teaching the skills employers are looking for. LSBU was one of the first universities to embrace degree apprenticeships, where students divide their time between workplace training and higher education. The University has also invested extensively in facilities and development – spending on average £2,248 per student, bringing it to 45th place in The Sunday Times rankings. LSBU has invested more than £50million on teaching facilities, and a further investment of £38million in campus redevelopment is in the pipeline. The University has made gains in seven of the nine performance indicators that make up its new The Times and The Sunday Times ranking. A fully searchable website with university profiles and 67 subject tables is published in The Sunday Times Good University Guide.